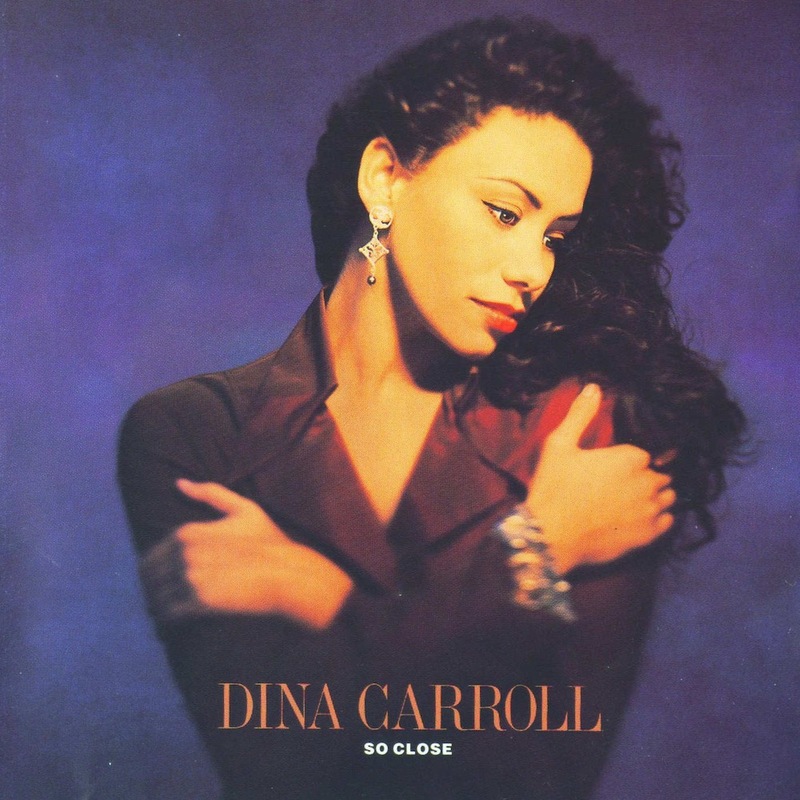 Today’s POP RESCUE is the 1993 debut album So Close by British songstress Dina Carroll. I admit that I had this album on LP back in 1993, so it’s not a complete mystery. Dina had been a huge success, and so she could hardly have passed me by. Now, with the CD to hand, I can delve back in, with two bonus tracks, to see if the album is as good as I once thought. The album opens with the wonderful drum beat of second single Special Kind Of Love – a song that’s written by men-of-the-moment Robert Clivillés and David Cole (aka C+C Music Factory). This song feels reminiscent, almost of Motown, and keeps perfect pace throughout. Dina’s vocals really shine here on this catchy track, and she’s supported by some great warm strings and backing vocalists. This is flawless, but it wasn’t enough to get it beyond #16 in the UK charts in 1992. This is followed by Hold On, which takes a much slower tempo, ushered in by some soft saxophone over a light brushed beat. Dina’s vocals are strong, although the lyrics are somewhat downbeat although are laden with a message – ‘gotta live your life the way you choose, learn from the change you go through and hold on‘. This time, amongst the bursts of moody saxophone, she’s joined by whistles and male backing singers. This feels a bit b-side, but it’s a nice gentle song. This Time – the fourth single from the album – is up next. We’re into ballad territory, ushered in by some strings, piano, finger clicks, and the magical sound of tingling bells. This song is musically and vocally a really nice warm song – with plenty of space for Dina to show off her vocal diversity. What i’d never realised, is that Easther Bennett and Vernie Bennett (of Eternal) are here on backing vocal duties, and as if that’s not enough, The New York Philharmonic Orchestra have got the music covered. This song reached #23 in the UK singles chart. Up next is Falling, a more dance-orientated track with some near Italia house piano. There’s some really funky bass and beats here, and it lets Dina flex her bigger, dancey vocal style. She sounds like she’s smiling whilst singing this catchy track. This really could have been a contender for a single. The album’s title track, and third single, So Close, follows this. We’re back to ballad here, and Dina’s vocals are so rich and warm whilst it gently plods along, but you can just tell that she’s building up to something wonderful in the chorus – and her vocals really don’t let you down. At times, this song does remind me of her contemporary Lisa Stansfield, but Dina manages to outshine her. Sixth track is the great lead single Ain’t No Man, which is a lovely little piece of up-tempo light pop. The hard-to-find video is all smiles and fits the song perfectly. This is such a catchy little number – it’s pop beat, big huge dance vocals, synth brass riffs, and dance piano. This song reached #16 in the UK charts back in 1992, but deserved to reach higher. There’s quite a few contemporary remixes floating around too, all of which pretty much stand up well in the 23 years since it was released. Express is up next, and this would give Dina her second highest charting single from this album – reaching #12. This song is dance again, with lots of synths, samples, and layers of instruments and vocals over a funky bassline. There’s a lot of whispery, sometimes sultry, vocals here, and this in turn reminds me of some of the vocals from Madonna‘s 1994 hit Human Nature. In contrast Heaven Sent, is a somewhat gospel song. Again, The New York Philharmonic Orchestra are here, and again by surprise but this time complete coincidence whilst thinking ‘this could have been done by Whitney Houston‘, I read that Cissy Houston (her gospel singing mother) is on backing vocals alongside the New Hope Baptist Choir. This must have been quite an expensive album track to produce, but it allows Dina to show off her vocal diversity once again. This is followed by You’ll Never Know, a lovely downbeat song, in which Dina’s vocals stand strong and defiant whilst her backing vocals offer up the perfect contrast. Piano, strings, bass and handclaps give the song a somewhat minimalistic sound – again allowing those vocal chords to shine. Not as catchy as some of the songs elsewhere on this album, but it’s a nice enough track. Dina’s huge hit Don’t Be A Stranger follows – a #3 UK hit single. This song was the final single from the album and with the LP version, it was also the perfect final track. This song is wonderful and absolutely faultless. Once again, Dina’s vocals are rich, strong, and flawless. It was clear that this belter of a song would push her towards recording more big ballads. Into new territory for me, the penultimate track and first of two CD-only bonus tracks, is Why Did I Let You Go? which returns Dina to the more pop-dance piano sound. At times, the piano in this song reminds me of something you might find on Kym Sims‘ 1991 hit Too Blind To See It. The album closes with gentle piano and strings on If I Knew You Then, with Dina’s vocals dancing over the top of it until the guitar and gentle percussive beat arrives. This is a gentle little warm song, and whilst it’s not the perfect ending that Don’t Be A Stranger gave the LP version, it’s a close second. Over all, this album really is fantastic. There’s just enough of a variation from luxurious ballad to still-fresh sounding dance/pop, to make this album a brilliant listen to all these years later. The singles were chosen well, and she received the success that was due. Don’t Be A Stranger to this superb album. Where is Dina Carroll now? With Don’t Be A Stranger still in the charts, Dina released The Perfect Year from Andrew Lloyd-Webber‘s musical Sunset Boulevard. Dina picked up Best Female Artist at the 1994 Brit Awards and she continued success with her second album which was released in 1996 – Only Human, and then plans to release her third album hit problems when her cover of Dusty Springfield‘s Son Of A Preacher Man was pushed back in the release schedules due to Dusty’s death. After being dropped during a series of high-profile artist drops by her label – which included Eternal and Michelle Gayle, Dina left in 2000. She signed to Universal Music Group, only to depart in 2003 after releasing a greatest hits, and recording a cover of Van Morrison‘s Someone Like You for the Bridget Jones’ Diary (2001) soundtrack. And that’s that. Where she is now, is anyone’s guess. Despite huge success, and an accolade of having the biggest British Female album in history between 1993 until Dido’s 2001 album, her whereabouts remain unknown by the media. POP RESCUE COST: £1.99 from a British Heart Foundation store. Posted in 1990s, C+C Music Factory, Dina Carroll, EternalTagged 1993, Ain't No Man, album, C. J. Mackintosh, Cissy Houston, David Cole, Easther Bennett, Eternal, Howie B, New Hope Baptist Choir, Nigel Lowis, review, Robert Clivillés, So Close, The New York Philharmonic Orchestra, Vernie BennettBookmark the permalink.